Got Pickle Juice? Uses for Leftover Brine. What do you do with your leftover pickle juice? When I say pickle juice, I mean any brine left over from a ferment. I’m not referring to the food coloring laden vinegar from store bought pickles. We know that brine is teaming with all sorts of good stuff, lactic acid bacteria, B vitamins and lots of flavor. I can’t bring myself to just pour it down the drain. “What can I do with left over brine?” is one of my most often asked questions. I’ve complied a list of ways I’ve used it and have heard others use it. Please comment if you have any other brilliant suggestions. 1.Bottoms up! The best way to use it is to just drink it. I may be weird but I like it. Not a tall glass of it but a swig here and there. 2. Sprinkle a bit over your dinner. It’s a great way to get probiotics in a kid who refuses to eat them. 3. Add a few tablespoons to soup. It adds just a bit of flavor and the kids won’t even notice it. Add it to your bowl after its cooled enough to eat so you don’t kill off all the bacteria. 4. Make salad dressing out of it. Use leftover brine in place of vinegar in your favorite vinagrette recipe. Try it in this lemon poppyseed dressing. Yum! Just be sure the ferment compliments the dressing. Cauliflower brine has a strong taste where green beans aren’t so overpowering. I used the brine from asparagus with onions and it was yummy. 5. Marinade. Pour over your meat for a tasty marinade. While cooking it will kill off the bacteria, it will still add good flavor to your meat and it does a great job tenderizing it. 6. Feed it to your animals. My chickens love it! 7. If you are a juicer, add a bit of brine to your vegetable juice. 8. Bloody Mary anyone? Just a splash will do. 9. Potato Salad, yum! Use in place of vinegar in your German potato salad recipe. I should post a recipe. Love potato salad! 10. Sprinkle over sautéed greens. 12. Many people use it to inoculate future ferment batches though I prefer to let the ferment run its natural course. 13. If you find yourself with more than you can consume, instead of pouring it out, add it to your compost. I’m sure there are plenty of things I’ve missed. Let me know if you have any other great suggestions. 22 comments to Got Pickle Juice? Uses for Leftover Brine. great ideas. Now we just need a re recipe to make the brine…. Add to 1 1/2 cup white vinegar, heat in a stainless steel pan until the liquid is clear again. Pour over vegetables. I haven’t tested it much yet, but it seems to be the right amount for two bell peppers in a 32-ounce jar. This produces sweet pickles; I’m not fond of dill pickles, so I didn’t make any notes about that. I could also have added bay leaf, mustard seeds, celery seeds, cloves, cardamom, or allspice seeds, but that’s relatively expensive for me. If you check my recipe section (there is a tab above) there are a ton of ferment recipes. The brine from any of them is great! I love those ideas! I bet it’d be good in mixed drinks like a dirty martini instead of olive juice. I’ve heard that too. Must give it a try! I just read an article about soaking potatoes in brine for 12 to 24 hours before you make french fries, etc. out of them. http://www.pickl-it.com/blog/783/traditional-potato-preparation-reduces-acrylamide/ Couldn’t the left over brine be used for this? What a great idea Anita. I’m going to try that. You can put hard boiled eggs in the brine to pickle them as well. @Sherry, How long will the brine and eggs last in the refrigerator when using left over pickling brine and how long does it take to “pickle the eggs”? Pickle juice is good in beer! And even better with a “red beer” using tomato juice or a V-8 type. Ooh, I’m going to try that this week! What a great idea! 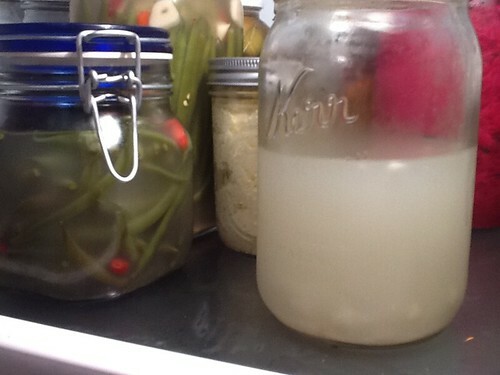 Raw Fermented Pickels: Retrain Your Gut! I have a lot of brine left over from an Italian green bean ferment (they are delicious!). I have been using it in salad dressing and just sipping it. Stored in a sealed pickle-it jar in the fridge. When I opened it this morning there was mold on the rubber jar gasket and the silicon center plug. The liquid looks fine. Is it safe? How to prevent this from happening again? That brine is so delicious mixed in with low sodium V-8 juice. Also tried it as a red beer ingredient. Lip smacking yummy! If your brine is a 2% solution, than you can also use it for making breads. I just used mine for sourdough from my cucumber garlic pickles. Came out great. Just match the brine to the type of bread. Why can’t you use the leftover brine to start at new batch with maybe adding a little more salt, garlic, ginger? I imagine you can use it for your next ferment, as long as your leftover brine doesn’t spoil. I imagine that there’s only a finite number of times you can use it. I am not an expert on the subject. I use my dill pickle juice several times. First I take out the individual pickles and put into small freezer bags and freeze them. Then I slice up sandwich size cucumbers, chilli peppers, saranos, jalapeno, banana peppers etc. Then I add some habaneros for heat to spice up everything. Then I add more salt and white vinegar and washed fresh dill weed plus mustard seeds and garlic. Then refrigerate a week or two. Then remove those vegges and freeze, repeat until you have too much then use the juice in a variety of salad dressing.